Recently I’ve been using a feature of Tridion that I don’t think is much discussed or known. In fact, while researching this post, the 3 experienced Tridionauts I showed it to had never even heard of it, which is funny since it’s hidden right out in the open on the publish dialogue. 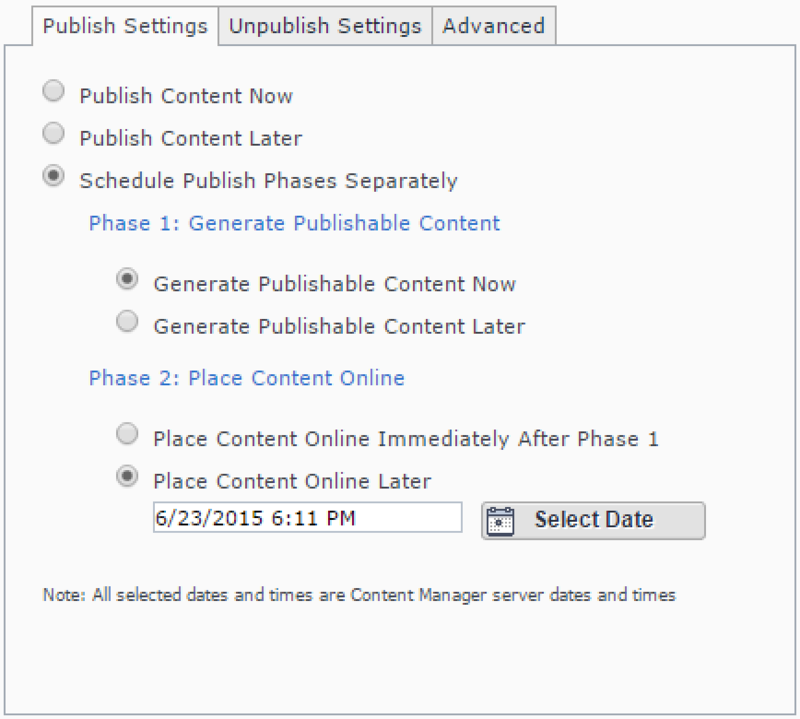 The “Schedule Publish Phases Separately” option does just what it sounds like, allowing you to break the rendering and deploying of your content to its publish location into two chunks which can be scheduled at different times. This comes in especially handy when you need to get a lot of content published in a short window of time, which has been the case with a few releases I’ve been involved with lately. By rendering all of the content during hours when the site(s) we’re publishing are online, we can deploy everything we need quickly during the small window if time when traffic has dropped off, usually during the middle of the night. Any changes made after the rendering phase won’t be published, so you need to be careful that Tridion changes are finalized before starting to render. This is different than just scheduling a publish, in which any changes right up to the scheduled publishing time will be included. If anything goes wrong while moving the rendered content from the incoming folder into your publish location you will have lost a lot of rendering. In my scenario where we only had a small publishing window, this can cost you a scheduled release. I will have a follow up post on how to potentially recover from this. One additional concern I did have was what would happen if the content was rendered and we had to cancel the publish. Luckily, Tridion accounts for this and sends a follow up package to the incoming folder to cancel out what you’ve rendered, meaning that you have time right up until the content is scheduled to be put online to stop the publish. Keeping these risks in mind, I still feel like this feature is useful to have in your Tridion toolbox and can be invaluable in certain situations. Stay tuned for a little more discussion on the topic shortly. This entry was posted in Releases by Tanner Brine. Bookmark the permalink. This definitely ranks up their with Custom Pages, Custom URLs, and Page Types as features that Tridionauts and clients seem to miss (I’ll also add SmartTarget Promotion Priority to the list). I had a client that was so surprised by scheduled publishing, I was asked to say it came with the upgrade (apparently staff had to come in on the weekend to publish). I suspect the reason Tridionauts miss this is because they’re typically not responsible for managing content in a business setting. Tridion Developers right-click on their item, publish, spam the Publishing status button (which taxes the CM a bit), and continue on with development. In contrast, I’ve seen an editor open a page first, choosing read-only mode to open it in the correct location. He’ll look at the page to make sure it’s correct and then press Publish from the ribbon toolbar within the page. Great point on keeping this in your Tridion toolbox. I’ve seen this abused to handle content needing to go live at a certain time. The other tools for making (dynamic) content go live at a certain time are metadata with the CD API and SmartTarget date triggers. For more background on Scheduled Publishing, see my StackExchange question and Frank van Puffelen’s description of the phases.